It was a stormy night in the Month of Awakening. Even at this time of the year, the last vestiges of winter were displaying their full force across Neopia. Thick blankets of snow covered the lands near the poles, and even along the equator there were strong blizzards and icy winds blowing at freezing temperatures. Krawk Island was no exception. In fact this whole month nothing but heavy black clouds had filled the skies in that part of Neopia, drenching the whole island in a constant downpour. “Month of Awakening indeed,” the Usul thought. This particular character was no ordinary character. He had been hailed as a war hero, he and his crew celebrated for the saving of New Maraqua. There had been a big celebration, lots of feasting and plentiful riches and rewards. Instead, he turned his back on the offer of a life of luxury in Maraqua in favour of a life of adventure, sailing the seas and plundering for even greater treasures. Fame and fortune had been his, even getting an article in the Neopedia and a spot in the Gallery of Heroes. However, instead of lapping up the fame he went off to continue his life as a pirate. He had all but disappeared from public eye ever since then, yet kept an ever-watchful eye on Maraqua. Garin sat on the bow of the Black Pawkeet, peering down towards the water. Even in the heavy rain, nobody could miss his signature red headband and two gold earrings glinting in his left ear. His ship was currently docked at Warf Wharf. Jacques and the rest of his crew had gone into town to drink themselves merry and celebrate another round of adventures. Garin hadn’t joined them. He had a more important appointment to keep tonight. Hopping up off the bow, he entered the hull of the ship, making his way towards his cabin. He had more than enough riches to buy a mansion in every land on Neopia, but he knew he would never live anywhere else but the Black Pawkeet. This ship was his home, his livelihood. He rummaged in his trunk, and took out a small, simple but sturdily made wooden box. The box held his most valuable possession, given to him by a dear friend. A glittering green seaweed necklace. He slipped the necklace over his head. He had kept it very carefully over the years in excellent condition, for his own use at least once a year on this very day. Making his way back up to the bow, Garin looked down at the water once again. “Here goes nothing,” he said to himself, and dove headfirst into the bay. The initial shock of cold water hit him, freezing his body up like a torpedo. Garin didn’t struggle, instead letting the water carry him into the depths of the sea. With the necklace on, he couldn’t drown anyway. When he finally regained sensation in his limbs, Garin begin swimming in the direction of Scurvy Island. That was their usual rendezvous point. The freezing water slowed him down a bit, but he had never been one to let such inconveniences get in the way. Having swum these waters so many times over the years, he knew them almost as well as he knew his ship. Before long, he saw his end point. A stony underwater ledge just off Scurvy Island, leading in the direction of Maraqua. And sitting on it, a beautiful blue Sea-Aisha. Isca sat with her back towards Garin, not bothering to turn around when he swam up to the ledge. “You’re late.” She held a long object in her lap, sheathed in a seashell case. Garin unsheathed the weapon and gasped at its beauty. It was a sword. It was nowhere near an ordinary sword though. The hilt was made of obsidian beautifully carved in an intricate design, and the blade appeared to be made of maractite but appeared to shine brighter and glow more than maractite usually did. Garin fished in his jacket pocket for the precious gift. He took the small pendant out and dropped it gently into Isca’s outstretched hand. Just then, a ray of sunshine burst through the water, causing both the blade and the pendant to glitter beautifully in the sunlight. Then and there, they both knew that nothing else mattered to them at the moment but the love and friendship they had for each other. Valentine's Day Gifts For Your Neopet! 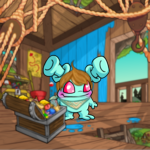 Valentine’s Day is all about celebrating with those you love, so why not splash out on your Neopets this year, to show how much you appreciate them. In case you may be falling short of some ideas of what to get your pet this year, here are some great ones that you can’t go wrong with! Biscuit shows how to love your family. Kind of. Psellia zoomed between the clouds in the skies of Meridell. The autumn air was cold but it did not bother her much. She was an air faerie after all and often used to the freezing temperatures where she often dwelled. Now that Christmas is over, the tinsel is down. Ornaments have been packed away for another year. Snow has transformed into rain. Everything is back to normal. Well, it was, until about a week ago. The shop owners of Neopia Central seem to have conspired together. Now, the streets are exploding with hearts, bunches of flowers, and reams of red and pink fabric and lace.